​This year I’m laying down the challenge for readers to join me (and head off on their own) in a voyage of discovery beyond the best-sellers. To those more overlooked places – the doors as yet unopened – the books which remain unread. Some authors will be more familiar than others, not all of them will attract every reader, but I’ve picked a calendar which offers (I hope) something to just about anyone interested in Scottish prose from centuries gone by. Hogg is a great place to start. Why Hogg for January? Here’s why. 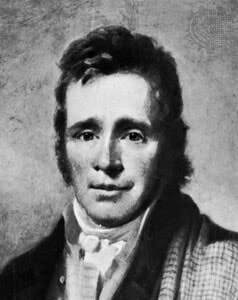 He had a habit of telling folk he was born on the same day as Rabbie Burns. It was a blatant lie. He wrote in an autobiographical piece, ‘I always thought to myself – what is to hinder me from succeeding Burns? I too was born on the 25th January.’ The fact that he was baptised on 9th December 1770 and was probably born as early as November in that year was not to get in the way of a good story. And that is Hogg all over. Hogg’s persona was constructed as ‘The Ettrick Shepherd’ and the reasons for this are many and various and take you far beyond prose (or poetry) and into the lands of publishing and politics (in the socio-political sense.) He’s interesting you see. Everything about him is interesting, not just his writing. But his writing is also interesting. Now, for ‘interesting’ you do have to substitute ‘challenging’ at times. Hogg’s prose is not for those looking for a nice, easy bedtime read. As a horse you’d say he wasn’t a novice ride. As a car I’d suggest you need to change gears – he’s no family hot-hatch, you need to get into low-ratio four wheel drive. But for those who like to go off piste, he’s a great man to engage with. Every reader will find their own journey and their own point of entry. Start where you like, but just don’t start with the most obvious! Leave Confessions of a Justified Sinner for a time. There’s a lot more of Hogg to explore. You might want to take the chronological route. Or pick a title that appeals and start there. It’s up to you. But a bit of route planning before you start is advisable simply to know what routes are available. The James Hogg Society offers a brief biography and select bibliography of Hogg’s work and work about Hogg. There’s loads of poetry, but our concern at unco is prose. The James Hogg Society (run from Stirling University) is as you might expect, academically oriented. It offers interesting online information though the blog isn’t updated that regularly. It’s £25 to join as an annual member. It’s a hefty fee unless you know and love your Hogg. But I suspect the price and tone is simply an indication that the ‘general’ Scots reader hasn’t caught up with Hogg any more than I have. The works are out there. And if we want inclusive literary societies (do we?) then we have to engage to develop them beyond the confines and constraints of academia. It’s up to personal taste whether you read about an author before you read their actual work – I tend to read about them enough to know what their output consists of but not so much that I absorb other views. I find a great joy in discovering a text for myself, but I realise that others can feel overwhelmed by doing this. They like to know what to look for. I like to look for what I can find. Both paths are acceptable. If digital is your thing there are many free downloads but the download quality can be poor. For a real ‘try before you buy’ experience you can download three short stories in a collection titled Devil I am sure. Please look at the article on digital navigation HERE if you want to explore this avenue more fully. Time spent on this diversion may save you much time later on. If you’re savvy with digital reading/downloading, don’t bother. Most of Hogg’s works are available as free digital downloads – The Shepherd’s Guide is perhaps not the best start point (unless you are really interested in sheep) whereas The Shepherd’s Calendar can be challenging to find in its entirety online because it’s in 2 volumes and it’s not always clear which volume you are downloading. Set aside a bit of time to deal with the technology on this one. I particularly enjoyed a couple of short stories towards the end of Volume 2 – on storms and dogs – so if you go down this route, make sure you find both Volumes. I found The Brownie of Bodsbeck free on Google Play. Amazon was little help to me. Open Library and Guthenberg again only had volume 2. This is an early (and frequently overlooked) Covenanting novel and is written largely in Scots. The Perils of Man and The Perils of Woman are both relatively easy to source and of course you are tripping over yourself with Confessions. I started with ‘Woman’ because I was interested in the structural games Hogg plays. New editions don’t tend to come cheap but there are second hand versions available of many of the works. Libraries may also be a good source. The Edinburgh Companion to James Hogg (edited by Ian Duncan and Douglas S.Mack) from 1995 is well worth the read if you want to find out a bit more about Hogg’s life and themes. There’s a decent variety of chapters and a brief biography. The 2012 edition is available from around £15 on Amazon. It’s an academic book, though it works as well for the interested general reader. You may well be able to pick it up in a library. I always advocate libraries as the first port of call for a book you don’t know you’re going to love and keep forever. There are many reasons to read. It’s highly personal, yet something that can be shared. You may be picking up on the history of Scots literature, you may be trying to make sense of a canonical notion. You may be one who desires interesting structures, it may be characters which interests you most. You may read for the simple pleasure of it – and when one reads for enjoyment I suggest one tends to read works that accord with one’s own world view rather than works whose themes and philosophies grind. Read Hogg for any of the above reasons and you’ll not be disappointed. But if you have a Romantic standpoint – if you’re more Shelley than Auden, more Bronte than Austen, then I suggest you may be more Hogg than Scott and in that case you have an absolute feast of reading ahead of you. Confessions has its Gothic element and that’s all well and good. But there’s also the structure and the psychological element to read – and that makes it engaging. In the context of its time it is radical. And it still has plenty to say. And of course it’s the easiest one to ‘find’ which means that the unsuspecting reader is really being pushed towards that point. Resist. Find your own entry point. Yes, read Confessions, but only once you’ve read something else and got swept away by Hogg’s supernatural and natural powers of persuasion!